We’ve taken a detour from our normal coverage of Virginia hiking and biking! 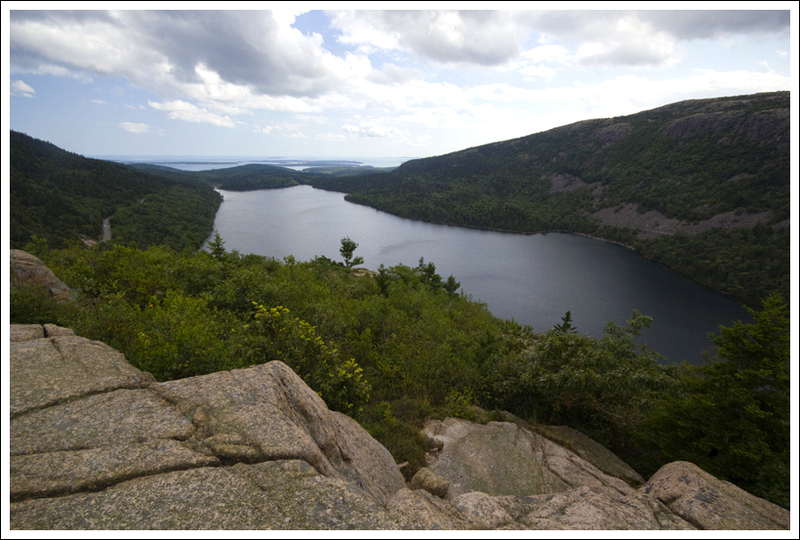 For the next five posts, we’ll be doing a special edition covering the trails of Acadia National Park in Maine. 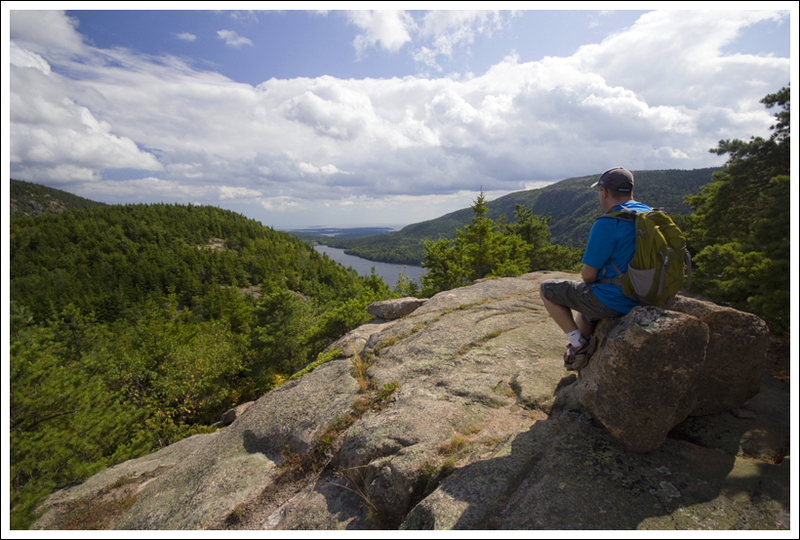 The Bubbles hike consists of two small mountains that overlook Jordan Pond. One of the key features on this hike is a large glacial erratic hanging on the edge of the south Bubble. Adam pretends to support the giant glacial erratic known as Bubble Rock. 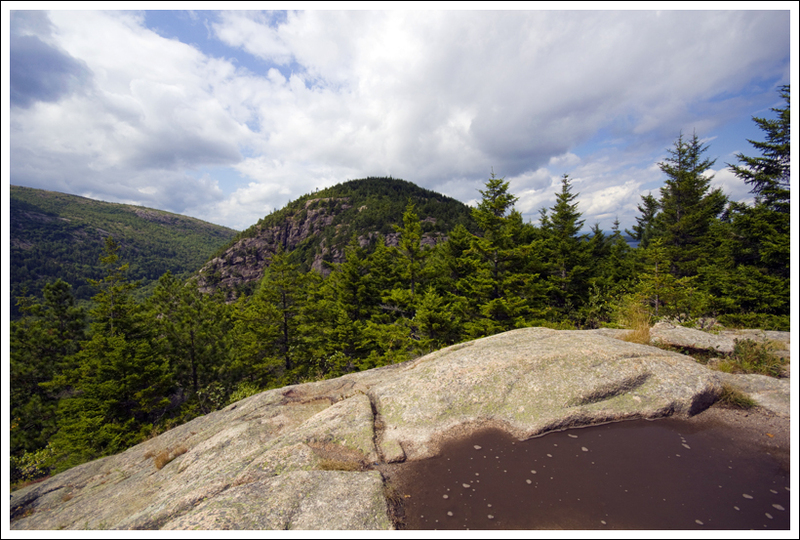 Below: The first viewpoint along the trail up the South Bubble; A view of Jordan Pond from the South Bubble; You can see how precariously the erratic hangs on the side of the mountain; When you visit the Jordan Pond House you get a great look at the Bubbles from a distance. The two small mountains have such a distinct shape (photo from another trip). We had an extraordinarily tough drive up to Maine this year. We left on a Friday with plans to stay in Sturbridge, MA for one night and then finish the trip to Maine the following day. We were counting on a lot of weekend and rush hour traffic around Boston, so we thought breaking this into a two-day drive was a good idea. Well, the drive on the first day should have taken us around 8 hours and ended up taking us over 12 hours. We ran into an over two-hour delay near Allentown, PA and Connecticut traffic is always ridiculous. On Saturday, we had a better day of driving to get to Mount Desert Island We were very eager to stretch our legs when we got there. When we vacation, we are not ones to idly relax; we like to pack in as much as possible. 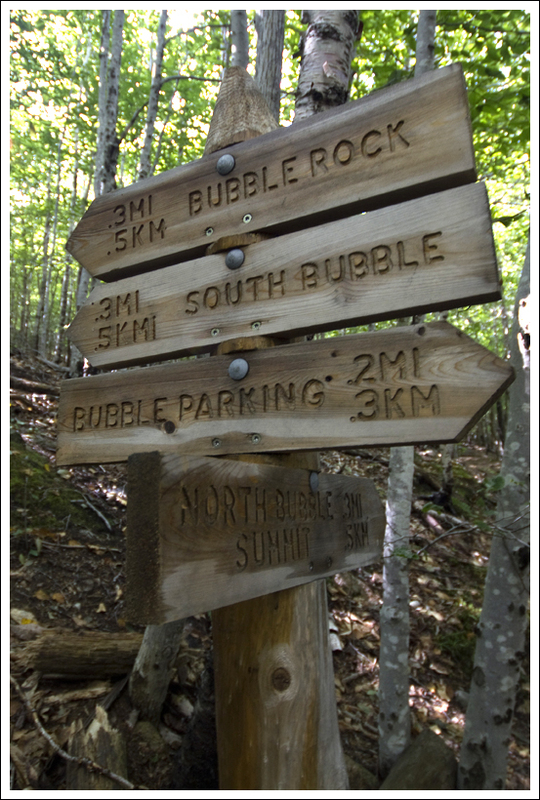 We have hiked up the Bubbles a couple of times in the past, and have always enjoyed it. Since this is a short hike, you should be able to fit it in a narrow time period. From the Bubble Rock parking lot, start off on the Bubble Rock trail. At .1 miles, you will reach a junction with the Jordan Pond Carry Trail. We went past this and just continued straight on the trail. In about .3 miles, you reach a junction where the North and South Bubble trail split. Take a left at this junction and continue the path up to reach the top of the South Bubble. Take in the views and then go back the way you came. At the previous junction, then follow the path to the North Bubble summit. You can this take this path back to the junction and then just take a left to head back to your vehicle. Another view from the South Bubble. Below: Trails are very well-marked throughout Acadia; Adam scrambles to the top of the boulder pile to reach the summit marker on the South Bubble; The sun came out a bit more by the time we climbed the North Bubble. 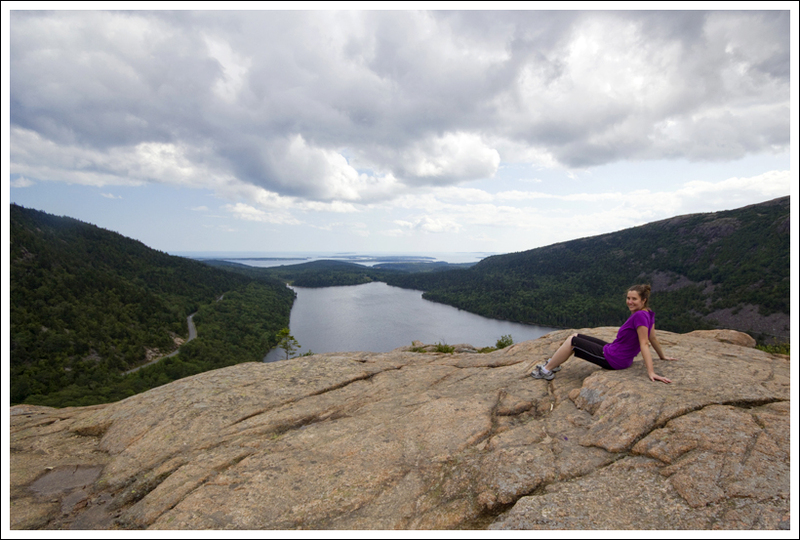 When you reach the summit of the South Bubble, take in the views of Jordan Pond and also take some time to find Bubble Rock (not to be confused with Balance Rock, which is located along the Shore Path in downtown Bar Harbor). It was amazing to see all the people that try to push on the rock in hopes that they can personally move a multi-ton granite boulder. There was one family that we enjoyed watching that had a couple of younger boys with them. One of them held a stick like a spear and seemed to have a little violent streak running through him. He kept wanting to throw his stick at things. We overheard him telling his family, “When I see things, I want to chuck my spear at it SOOOOO BAAAAAD!” I’m curious to see how his deviant behavior develops over the years. From the Bubble Rock, you can also get some views of the Park Loop Road below. This hike pays off with stunning views despite little effort. We also enjoyed talking with a couple at the North Bubble. They were taking part of a quest to visit all of the U.S. National Parks. They had been to lots of places over the last few weeks and had come from Canada a few days before Acadia. They took some pictures of the two of us and we returned the favor. They said they were sending their pictures to their friends that were cursing them at all of the things they have been able to do. I guess once you make your friends envious, you have to keep it up. I will say that the North Bubble is a little steeper to climb up, but the views from both of the Bubbles are great. 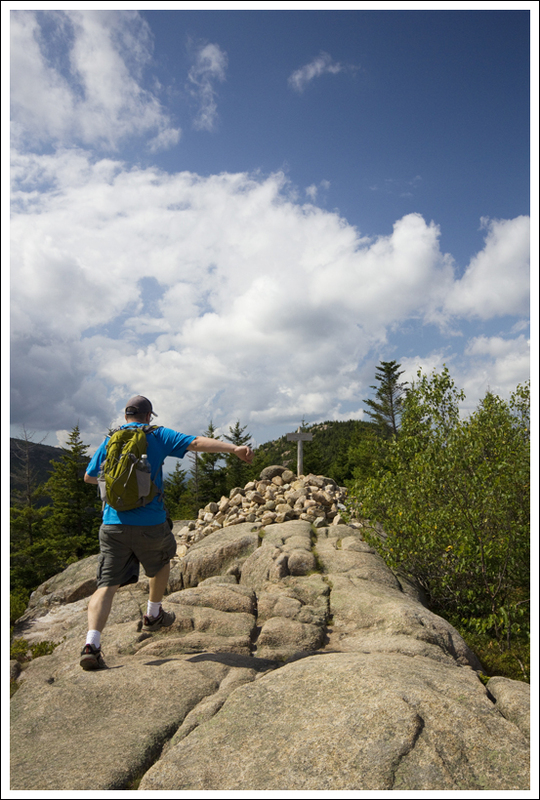 We hope that you enjoy our reviews of Acadia National Park hikes. We have been going there for years and I think you will see that over the next few blog entries that this is a place that you should put on your “must visit” list! There is a reason that nearby Bar Harbor, ME was once called “Eden”. This area really feels like a paradise to both of us. We rolled onto Mount Desert Island, home of Acadia National Park, in the early afternoon after an easy six hour drive from Massachusetts. It was a beautiful afternoon with a cold front pushing out the last of the dark, gray storm clouds and humidity from the day before. We were really eager to start enjoying the park, so instead of going to our hotel, we immediately headed to the Acadia Visitor Center. We changed into hiking clothes, bought our park pass and set out to do the short hike across the north and south Bubbles, overlooking Jordan Pond. 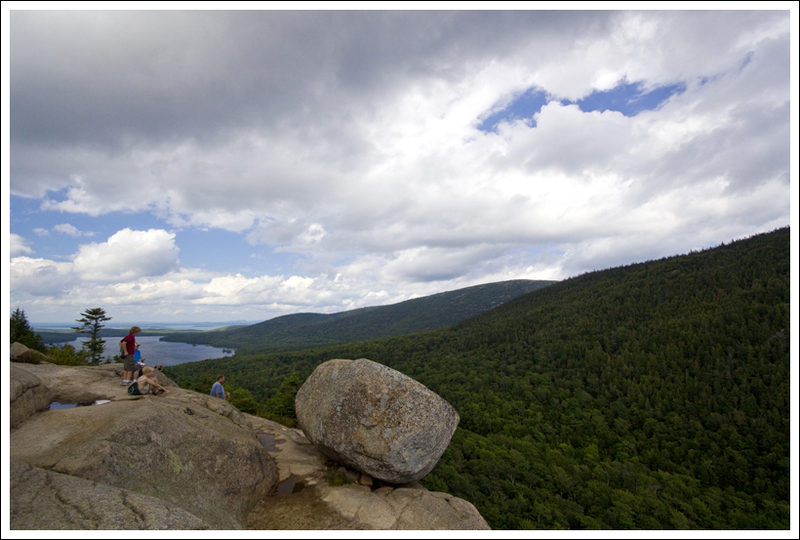 The hike is short and easy/moderate, so it’s very popular with families and novice hikers. Even so, most of the traffic had cleared out earlier in the day, so we were able to find a parking spot right at the trailhead. Anyone who visits Acadia knows how rare that is! Acadia is one of the smallest and most congested national parks, so we always try to plan our activities at non-peak times to avoid crowds. The trail climbs from the parking lot. It starts off smoothly, but soon you’re scrambling over roots and up granite ‘stairs’. It was a little wet from storms the night before, so we had to be careful of our footing. There aren’t many footing surfaces more slippery than wet granite! The first viewpoint we came too came atop a rocky shelf, mostly overlooking the mountains, but with a little snip of water visible. After snapping a few quick photos, we made our way to the summit of the South Bubble. The View from the North Bubble. Below: Christine and Adam enjoy views along the hike. Of the two Bubbles, the south peak is quite a bit more popular due to the presence of ‘Bubble Rock’ – a glacial erratic that sits precariously on the side of the mountain. It looks like it could go rolling down the mountainside at any moment. It’s always fun to sit and listen to people plotting to push the boulder off its perch. Some people think it would take a group pushing effort; others contemplate the lift power of a lever. 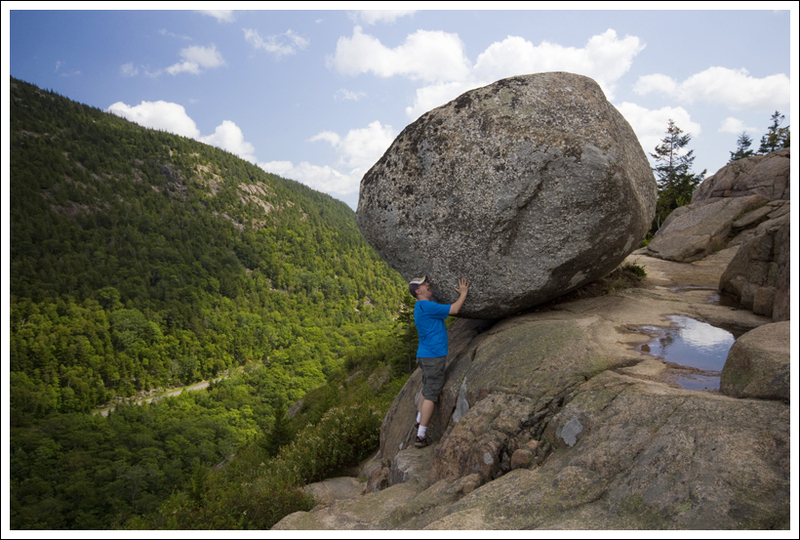 Personally, I think when the boulder falls; it will be solely Mother Nature who moves it. I hope it doesn’t happen in my lifetime, because I like the boulder right where it is! Another fun tradition is to take photos of your hiking buddies pretending to hold the boulder up. 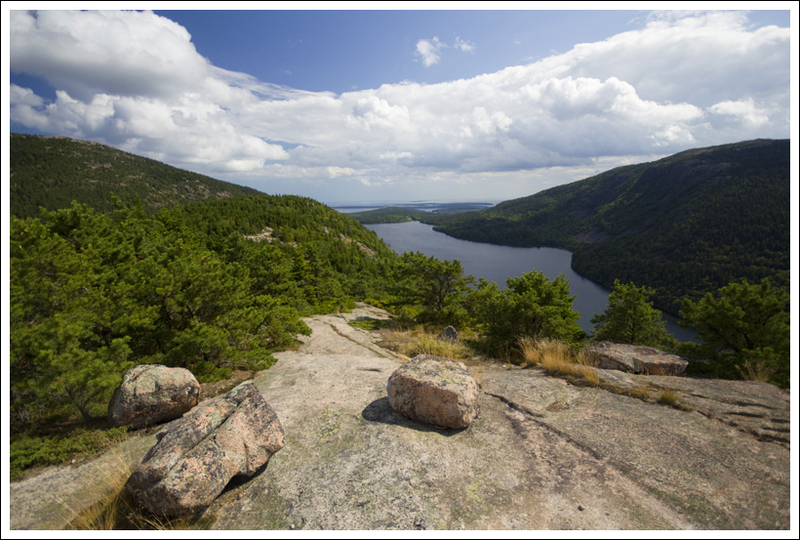 If you hike past Bubble Rock, the trail leads over to an open view of Jordan Pond below. It’s a lovely spot! To get to the North Bubble, you simply retrace your steps back to a trail junction marking the path north. The trail up the North Bubble might be slightly steeper, but it’s still a short and easy hike. We spent a bit of time atop the peak, enjoying the view and luxuriating in the cool, breezy Maine air. Being in Maine always makes me feel so happy. We hiked back down the way we came and were back at our car quickly. Even though the hike was nothing long or challenging, it was still a perfect way to kick off our week in Acadia! Difficulty – 2.5. These trails are very short, so most people should be able to do them. The South Bubble is fairly easy with the short distance and I would give about a 2 in difficulty. The North Bubble is definitely more of a steep trail and is closer to a 3-3.5 in difficulty. Trail Conditions – 3. The trail is very well-maintained and traveled. However, some of the footing can be slick in the rain on the granite. The North Bubble does have some steeper sections which make the footing a little more treacherous. Views – 4. Great views from both Bubbles. Wildlife – 0. We didn’t really see anything, but you may be able to see birds soaring above or relaxing on the lakes below. Ease to Navigate – 3.5. This path we took was more like a T, since you split off in different directions. Almost all of the trails in Acadia lead to other options to combine into loops with other trails. Solitude – 1. Due to the distance, this is an incredibly popular hike. 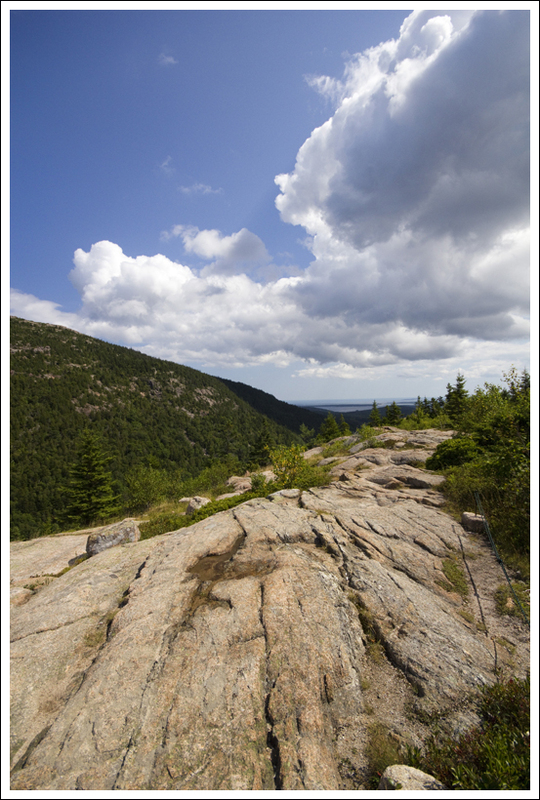 You will very likely have several hikers to share in the views if you go over the summer. 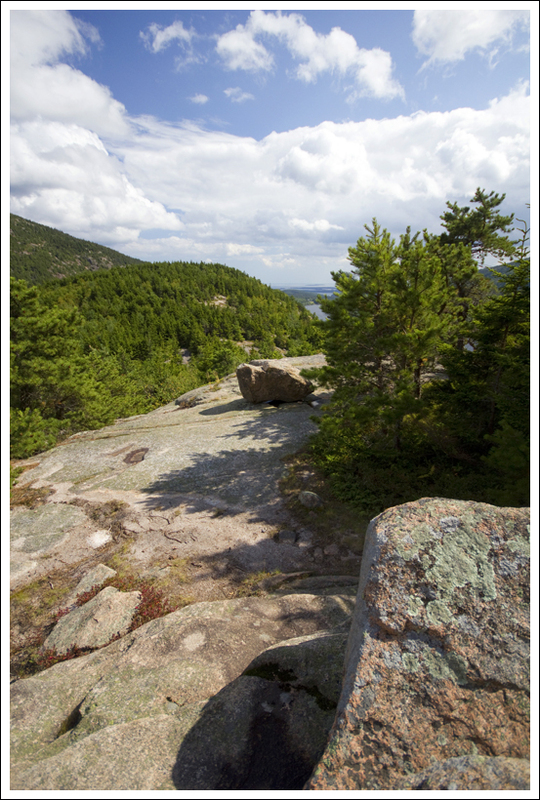 Directions to trailhead: On the Park Loop Road in Acadia National Park, keep following the road until you reach the Bubble Rock parking lot. This is just south of the Bubble Pond parking lot, so don’t be confused by the name. The trailhead starts from about the middle of the parking lot. Wow, beautiful scenery! I grew up in NH, yet never did any hiking in Maine. It’s now on my “To Do” hike list. That first picture of Bubble Rock is startling! It does look like it could release at any moment and pancake a few oblivious hikers and chipmunks on the way down. I’m eager to hear more about your visit. 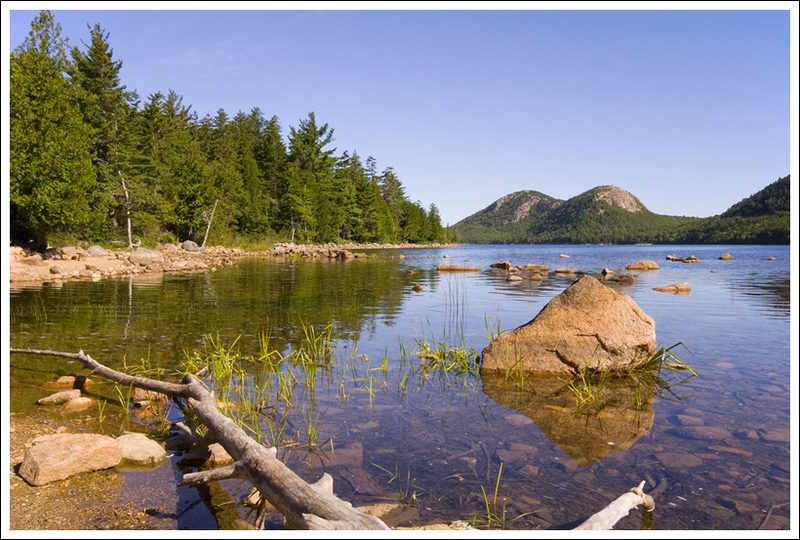 Perhaps one of these days we’ll rendezvous with you and Adam for a summer or fall hike in Acadia. That first day of driving sounds like it was harrowing. Thanks for the visit! We love to hike in New England for a change of pace. The terrain up there is so different from Virginia. Beautiful destination, Adam and Christine! When it comes to eastern North America, you picked a great destination.